At an exclusive girls’s boarding school, a sixteen year old girl records her most intimate thoughts in a diary. The object of her obsession is her room mate, Lucy Blake, and Lucy’s friendship with her new and disturbing classmate. Ernessa is a mysterious presence with pale skin and hypnotic eyes. Around her swirl dark secrets and a series of ominous and violent disasters. As fear spreads through the school, fantasy and reality mingle into a waking nightmare of gothic menace, fuelled by the lusts and fears of adolescence. And at the centre of the diary is the question that haunts all those who read it: Is Ernessa really a vampire? Or is the narrator trapped in her own fevered imagination? I’d been meaning to read The Moth Diaries by Rachel Klein for some time and then came across a copy at a department store for $11. Naturally I decided I had to buy it then and there especially as it was such a bargain. Before I read it I had gone through quite a few reviews out of curiosity because I wasn’t completely sure what it was about or how to take it. Was it a young adult romance (like so many vampire novels are these days)? Was it only a mystery? Was it considered dark fiction? I still wasn’t sure after I skimmed those reviews, but I did get another impression from them. That this was a story of unnatural obsession and the protagonist was apparently a whinger and completely head over heels in love with her friend in some instances. I don’t usually read reviews beforehand and very rarely read reviews afterwards unless it’s by friends or a particular book. After reading those reviews and then the book I have decided not to do that again because it was not what was expected. Some of those reviews were really off. 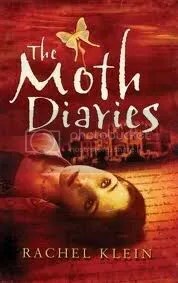 The Moth Diaries is neither a romance or a love story and it is barely a vampire story. It’s a hard one to define when it comes to vampire fiction and I can’t really make up my mind on that aspect of it. There are vampiric elements however and I find it very interesting with the contrast between both the character Lucy and the character in Bram Stoker’s Dracula. It’s sprouted as a vampire novel and there’s some very compelling aspects of it that reflect the story of Dracula, but I don’t really know what to make of it when it comes to vampires in the story. The book is written in the form of a journal which I really enjoy reading (I’m a journal-a-holic from way back) started by the main character as her way of keeping a record for her school year and of her life. It soon turns into something more with her recounting the goings on around her and her suspicions about the new girl. What makes it more interesting is that in the beginning the character writes an introduction and you learn that she has suffered from a borderline personality disorder and psychosis, but is recovered. Reading what follows I found that I couldn’t quite decide if this was all because of a mental disorder or because of the supernatural or both. It’s written in such a way that it doesn’t lean towards one way and by the end of it you really have to make up your own mind what was reality, what was reality for the girl, and how much of this was supernatural. I don’t see how the character is a whinger, she notices things around her that others don’t seem to care about, there’s no whinging what so ever. And yes she has an obsession with the new girl, but that’s because of her friendship changing with one of her closest friends. What I really read in this novel is loneliness, ostracism, depression, peer pressure, and destruction which are so common in teenage years. In saying that it’s not necessarily a typical young adult novel. Sure it is an easy read, but it’s not an easy story. It’s one of those novels that leave me very reflective afterwards and some novels that have done that are Brave New World and 1984. It’s a very intriguing read and I know I’m going to be thinking about it for days. Demographic: Young Adult, but in a lot of ways it doesn’t feel like a young adult novel. Reminds Me Of: A cross between Dracula, Picnic at Hanging Rock, and The Mothman Prophecies.